At last...three great boots sales on one day (and the sun shone). This is mu most unusual find..both in the same old suitcase with a mixture of treasures. I couldn't find the cutters..but at least I have whats left of the box! The Metal thing has "RONSON World's greatest lighter" stamped on it. 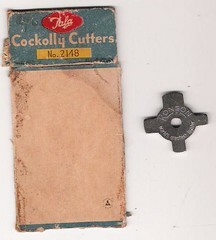 Not sure what a Cockolly cutter is? After a little search I found this web page which gives you some clues.